Paul Arel the founder of both Jukido Jujitsu and Kokondo Karate began his martial arts journey because he was bullied as a child. 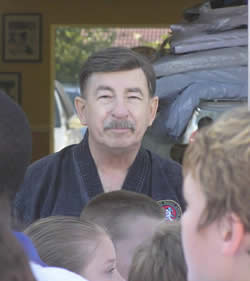 This experience created his love of the underdog and compassion to teach thousands of children to defend themselves. 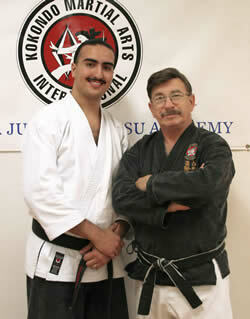 He began his training in 1950 as a student of Sudo Sensei a jujitsu master from Japan studying in Massachusetts. When Sudo Sensei left to return to Japan he left the small dojo in the hands of his best student, the new black belt, Paul Arel. Mr. Arel utilized his training as both cashier and “bouncer” at a store and beer hall. He quickly experienced what worked and what he needed to discard from his training. Paul Arel joined the Marine Corps a decision that crystallized his sense of honor and patriotism the hallmarks of his life. In the Marines, while stationed in Japan, he absorbed advanced training from Oriental masters on contract with the US government for both overt and covert purposes. He helped teach and develop the unarmed skills of his fellow Marines. After his honorable discharge he transitioned to civilian life stateside by opening the first karate school in Connecticut. His training with some of the greats in Karate is well documented. His Sensei throughout the 1960s were a “Who’s Who” of US Karate development: Isshin Ryu’s Peter Urban, Sankata’s Ishikawa and Kyokushin’s Mas Oyama. While learning and teaching these dynamic systems of Karate, Mr. Arel continued to teach the jujitsu learned from Sudo Sensei and refined by his experience in Judo and Jujitsu while in Japan. He ultimately called this art Jukido Jujitsu. 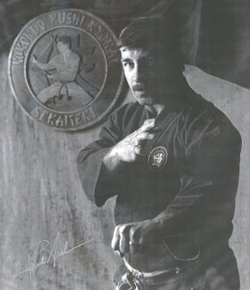 Karate’s continued movement towards tournaments and away from self-defense forced Shihan Paul Arel to develop the dynamic self-defense oriented style of Karate named Kokondo. 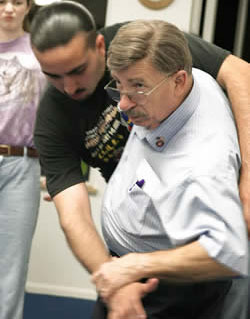 Paul Arel believed that the practice of kata was fundamental to self defense and his insights into the himitsu (hidden) techniques informed and infused his art. 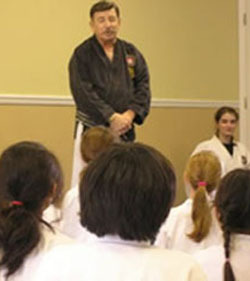 Shihan developed his unique understanding of three exclusive principals, underlying all of his techniques. They are kuzushi, shorinji and jushin. These three principles allowed Shihan to train and develop these two arts exclusively for the rest of his life. While, Shihan trained thousands of students in his career, Master John Fearns and Master Tom Wood continued their training from the early 1970’s through the expansion of Kokondo and were loyal to Shihan until his death. 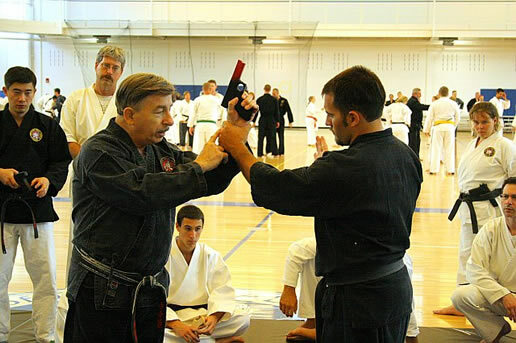 Their loyalty extends to Shihan’s successor Kaicho Greg Howard, to whom Paul Arel left the stewardship of his arts and the loyalty of his association.